Perfect for brunch, lunch, or dinner! 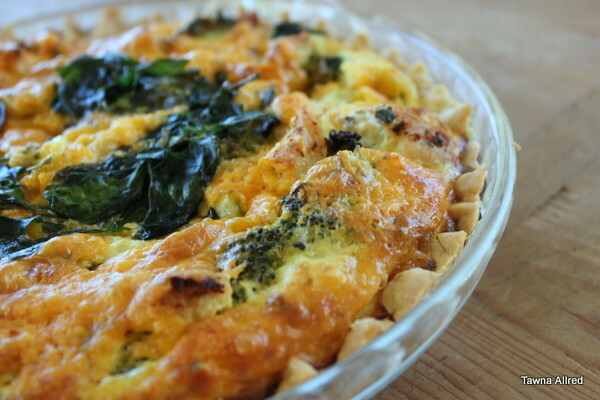 I hope you enjoy this quiche recipe. Oh, it has chicken in it too, but chicken cheese broccoli quiche takes too long to read and type, don’t you think? In a medium sized mixing bowl, whisk flour and salt together. Cut in shortening, then butter, with a pastry blender until it looks like there are small peas forming. Sprinkle on ice water, one T. at a time, over flour. Stir with fork, until dough comes together. Pat into a ball, cover, and place in refrigerator. Cook chicken. Whisk all other ingredients together (except the fresh broccoli and a little bit of cheese). Roll out pie crust. Place in pie pan. Bake in a pre-heated 375 degree oven for ten minutes. Pull out, let cool for 10 minutes, then add chicken and broccoli to the bottom. Dump filling over the top of the chicken and broccoli. Sprinkle with remaining cheese. Bake for 45-60 minutes until the eggs are set. Remove from oven, let rest for 5-10 minutes. Serve.